Hello everyone! My name is Daryn McMinn, and I’m a junior majoring in English at Ouachita Baptist University, which is located in Arkadelphia, Arkansas. I’m originally from Royse City, Texas, the epitome of small Southern towns. Having never lived so far from home and having never even visited Chicago previously, I’m experiencing a little bit of a culture shock living in the city. Seriously, life in a big city in the Midwest is very different than what I’m used to. I’m very thankful, though, that my transition to city life has been much easier than I thought it would be. Everyone, from the Chicago Semester staff, to the students participating in the program alongside me, to everyone at my internship site, has been so friendly and approachable, and I’ve already gotten to experience so much in just the three short weeks I’ve been here. My time has been filled with working at my internship, getting to know my sweet new friends, attending my seminar classes every Wednesday, and, of course, exploring the city! Since it’s what I’m investing most of my time in this semester, it’s important for you to know a little about my internship. I’m interning at a non-profit organization called Open Books, whose mission is to provide literacy experiences for readers in Chicago through inspiring programs and a bookstore that sells used books. My primary responsibilities for the semester are to the ReadThenWrite program; I’ll be able to help edit students’ work and give them feedback for their writing as a part of the process to have their work published in a classroom anthology at the program’s conclusion. Although I’m still settling into my role at Open Books, I’m having a lot of fun working and learning there so far! Aside from my internship, which you’ll hear more about as this semester progresses, I’m having so much fun experiencing some of the many things Chicago has to offer! 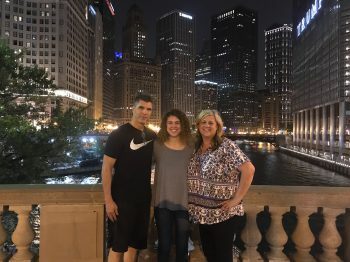 I was so blessed to have had my parents drive fourteen hours all the way up here to help me move into my apartment, and it was absolutely priceless to get to spend my first night in the city with them, walking around and taking in all the beautiful sights. Since that night, I’ve gotten to do countless other fun things…I’ve gotten to hang out at the beach, visit Lincoln Park Zoo, go to a Cubs game, and explore a couple of museums, just to name a few! I think my favorite day of the semester so far, though, was definitely last Saturday. First of all, the weather was 68 degrees and windy, even though it was the beginning of September–that’s a once-in-a-lifetime occurrence for a Southern girl like me! 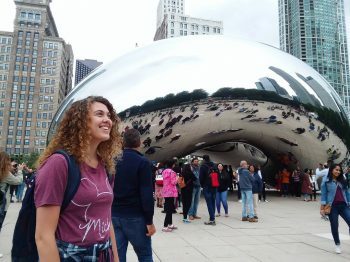 My roommate and I went to see the Bean at Millennium Park since neither of us had ever been to see it yet, and then we went to Peet’s coffee shop near the Chicago river to read and work on homework. After spending a few hours relaxing there, we went to Giordanno’s for the best deep dish pizza in the world! It was a day filled with lots of touristy things, which some of you city slickers might look down on, but it was a day worth having for someone as new to the city as I am! I’m excited for the numerous other fun things I’m going to get to do because of this amazing opportunity I have to live and work in Chicago. I’m thankful to get to share my experiences with you all, and I hope you’ll enjoy getting to read all about my city adventures yet to come!